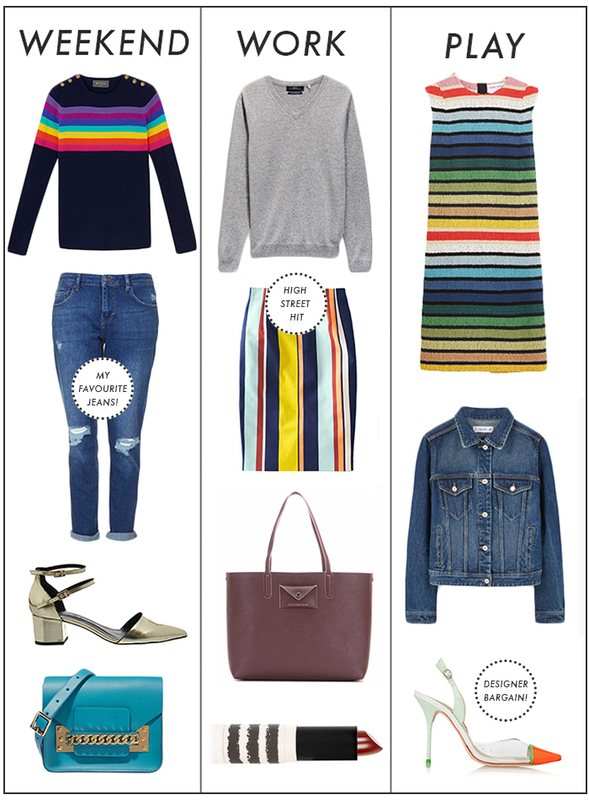 WEEKEND: Rainbow cashmere jumper, Wyse London. Lucas slim boyfriend jeans, Topshop. Major multi strap gold points, Office. Sophie Hulme blue leather shoulder bag, The Outnet. WORK: Cashmere v-neck, Next. Felicity skirt, Boden. Marc by Marc Jacobs leather shopper, mytheresa.com. Lips in hazard, Topshop. PLAY: Striped terry Sonia Rykiel dress, Net-a-porter. Dark denim jacket, Mango. Sophia Webster Daria pumps, The Outnet.